As 2013 wraps up and we begin a new year I would like to thank all of you for your support over the past 12 months. 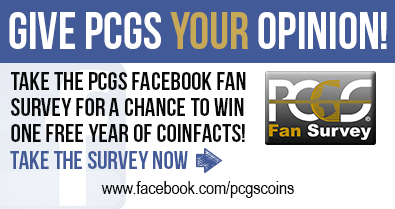 2013 was a very exciting year for PCGS. We added new services in the US. We opened new offices in Shanghai, China. Our offices in Paris and Hong Kong continued to grow, as did our US operations, helping PCGS reach over 27 million coins graded in our 27 year history. Collectors Universe Inc., PCGS' parent company, was selected as one of the top 100 small businesses in the US by Forbes magazine (#50 actually). Most importantly we continue to work hard to protect your interests and earn your confidence as the number one grading service in the world! What is your numismatic New Year’s resolution? 2013 – what a year for numismatics! Veteran numismatist Ron Guth recaps the top sales of 2013, including a list of the Top 5 Coins sold at public auction. Can you remember all the top sales of 2013? Read more to find out. Perhaps no concept in numismatics is more difficult to understand and interpret than “rarity.” This point was hammered home in a recent discussion PCGS had internally concerning setting up a new rarity scale for our CoinFacts site. Is rarity in numismatics absolute? Or relative? PCGS Director of Education Mike Sherman explores the issue. Building on Mike Sherman’s explanation of rarity, Ron Guth guides you through how to use PCGS CoinFacts to estimate the rarity of coins you’re seeking for your collection. As Ron points out, rarity estimates, when combined with pricing information and other data, help you chart a roadmap to success as you plan your collecting goals. Read more to get an in-depth look at the PCGS Rarity and Survival Estimates. Ira and Larry Goldberg, along with Bob Grellman and Chris McCawley, are proud to announce the sale of the Missouri Cabinet Collection, containing 228 US Half Cents, on January 26, 2014.